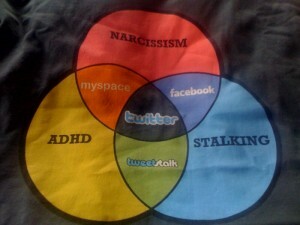 There are over 500 million Twitter accounts with over 200 million represent active users globally. I’d say that qualifies it as a solid source for finding and engaging talent for recruitment. Of course, you can’t engage someone you haven’t found in the first place, and it’s been far too long since I’ve posted an update to how to search Twitter to find people – can you believe it’s been 4 years?!? 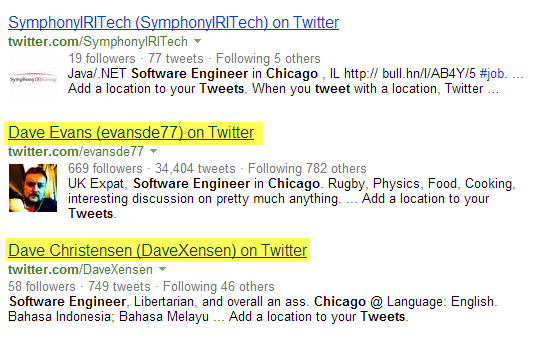 It was just the other day that I was hacking around on Google and Bing trying to find people on Twitter based on the text in their bio’s (yes, I am familiar with Follwerwonk – you’ll see why I prefer Google/Bing in a moment) and while I was getting some results, I wasn’t getting as many as I thought I should, nor were the results as “clean” as I would like. 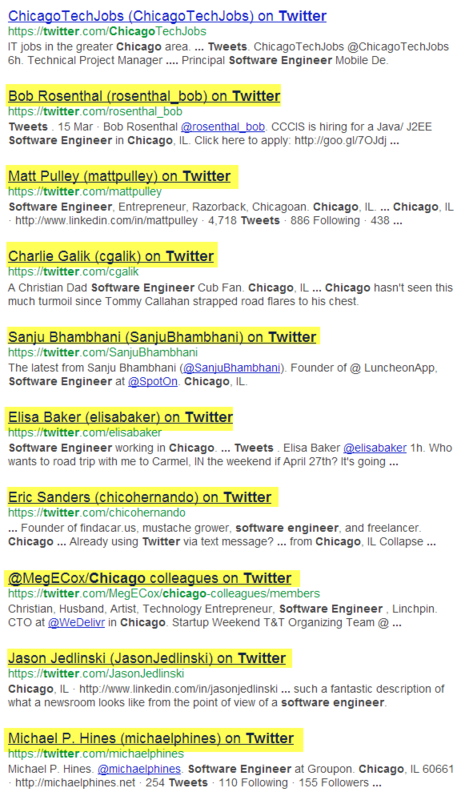 That led me to a few minutes of tinkering with Bing and Google and I made a few discoveries with some simple pattern recognition that I would like to share that will help you quickly find your target talent pool on Twitter. 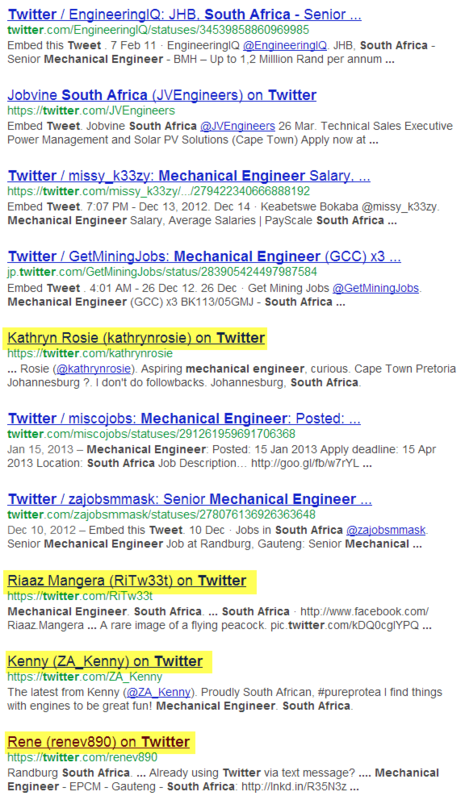 I use two main examples – mechanical engineers in South Africa and software engineers in Chicago – you can of course fork my Boolean strings to suit your specific sourcing needs replacing my titles and locations with yours. 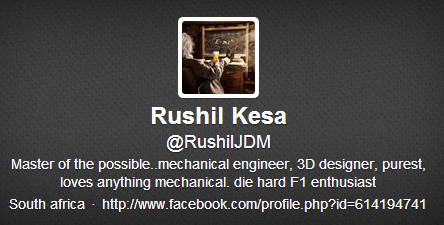 While I do search for what people tweet about, I prefer to search for information contained in Twitter bio’s/profile summaries where people often identify themselves by what they do for a living (e.g., software engineering, accounting, etc.). 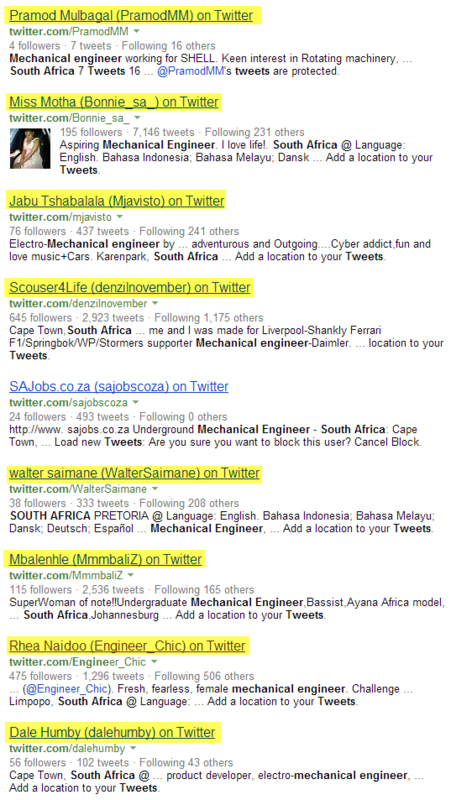 Getting back to the Bing search results – you probably noticed the top 3 results were for “jobs” accounts. I tried adding a simple -jobs to the string and for some reason it kills the search and returns 0 results. Then I noticed that many of the job posting accounts have “jobs” in the title lines, so I simply added -intitle:jobs to the string. 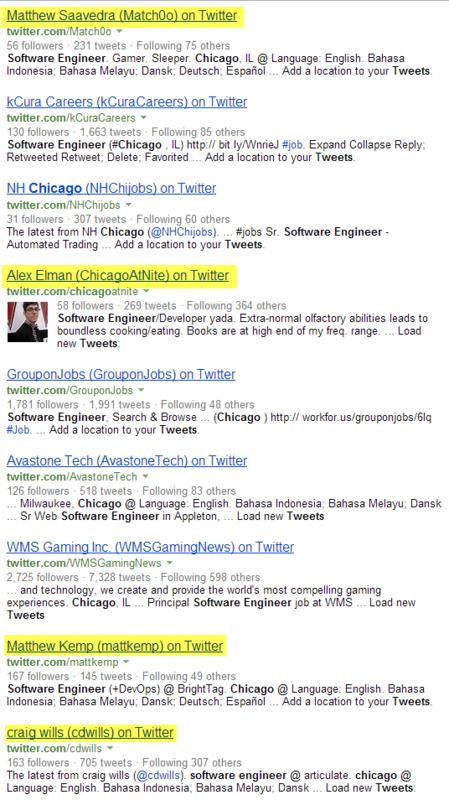 As you can see below, only 1 job posting account was able to sneak in – the rest are profiles of people. Simply overlooking the job spewing Twitter profiles is easy – I often advise people that an acceptable percentage of false positives is fine with any search. Trying to “over cleanse” results can have undesired consequences, such as eliminating valid results. Always remember – every search you run both includes AND excludes qualified people/desired results. Think before you tweak! 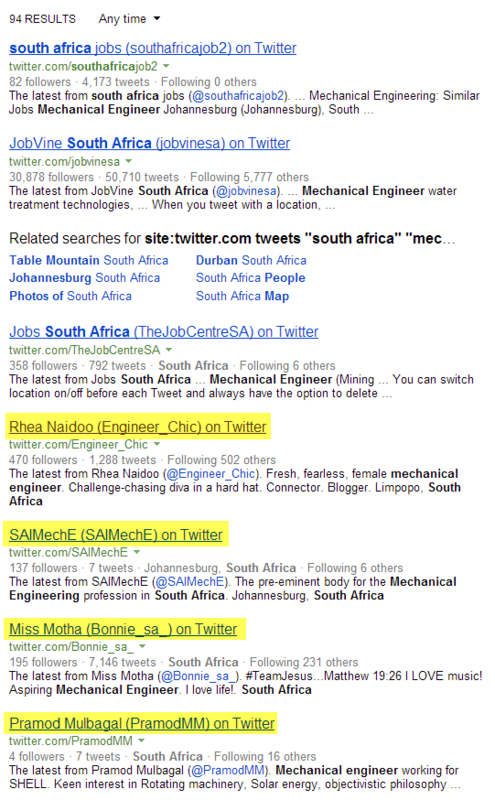 So how many results would Follerwonk return in a Twitter bio search for mechanical engineers in South Africa? 51 vs 88 for Bing. While there are no doubt a few false positives in the Bing search, I didn’t have much trouble quickly finding people in the Bing search results that Followerwonk did NOT find. This confirms my concern with any search app/service like Followerwonk – they simply don’t index as many Twitter profiles as the major search engines such as Bing or Google. 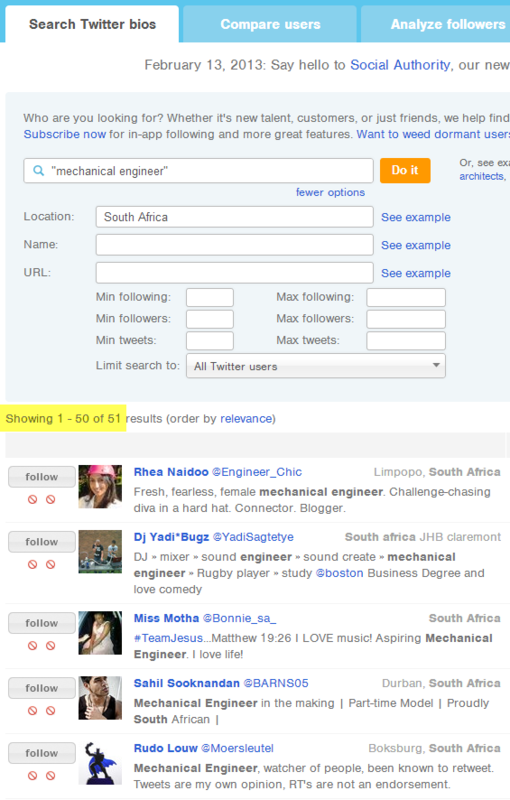 Feeling pretty good about what I had found using Bing to find mechanical engineers in South Africa, I tried searching for software engineers in a large U.S. city. As you can see, 6 out of 12 of the first page results are people, and most of the other Twitter accounts are for actual companies, not just job spamming accounts. 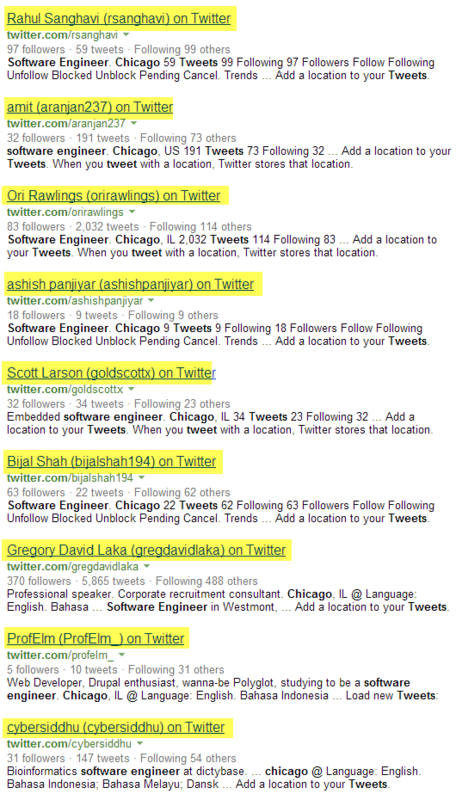 Moving to page 2 of the results, 100% of the results are individual profiles of software engineers. Sweet! As you can see from just the first page of results, Google turns up more job posting accounts than Bing, which returned only 1 job posting account with the exact same search. 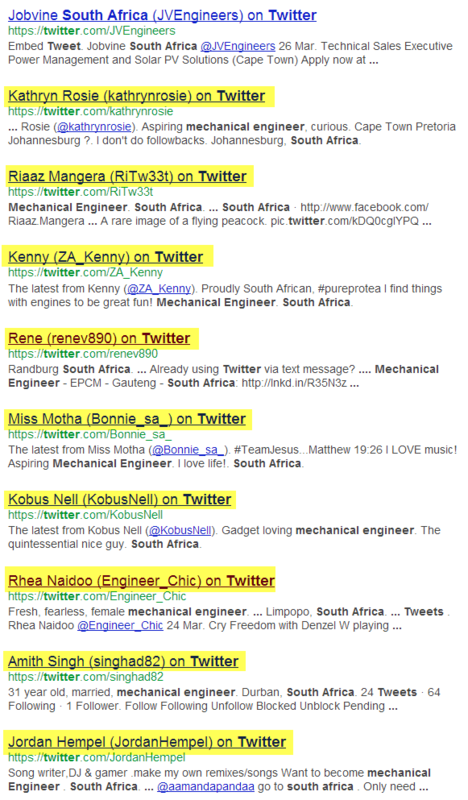 Google only returned 4 real people in the results. 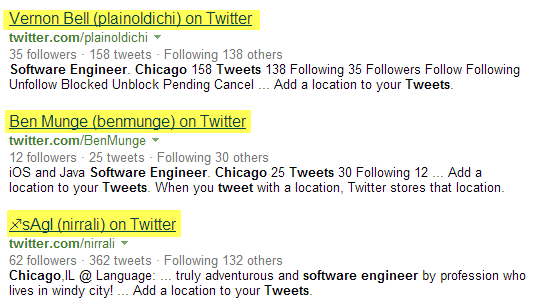 I find it interesting to see the differences between Google and Bing, especially when it comes to such a simple search! I’ve been trying to tell people for years that Bing is a bit “cleaner” than Google with regard to searching sites like LinkedIn and Twitter. The results above offer further evidence to support my claim. Anyhow, I looked at the results and noticed a pattern in the false positives (job spewing/non-people Twitter accounts) – most mentioned “status” or “statuses,” so I decided to exclude those terms from the URL’s. As you can see, Twitter search services like Followerwonk do a good job of making it easy to search for and find people on Twitter, but they don’t index as many Twitter profiles as the major search engines such as Google or Bing. As such, if you’re only using Followerwonk or similar sites to find people on Twitter, you’re only finding some people – and certainly not all of the people that are actually on Twitter. Also, when it comes to any information retrieval exercise, a little bit of pattern recognition goes a long way. Imagine how many people describe themselves and their locations with non-standard terminology and you have a glimpse into the hidden talent pool waiting for you to explore on Twitter, Google Plus and other social networking sites.